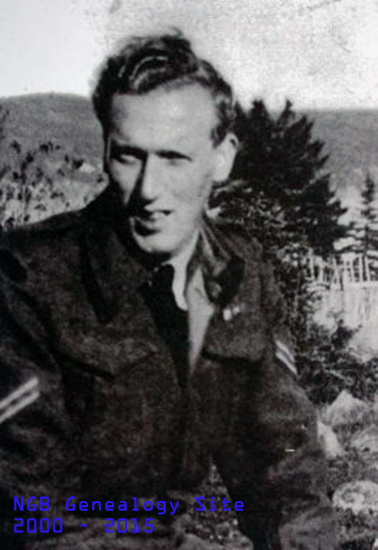 On the 26th of June, 1941, Fred Drover was one of six Newfoundlanders who joined the Royal Rifles of Canada when that battalion was stationed in St. John’s; he was 19 years old at the time. Three months later he was transferred to Québec with the Royal Rifles for further training prior to being posted overseas. Following approximately five months of extensive training they, along with the Winnipeg Grenadiers, were shipped by train for Vancouver, B.C., where they boarded a converted passenger ship, the Awatea. The soldiers were not told that their destination was Hong Kong until they were part way across the Pacific Ocean. They arrived there on November 16, 1941. Although tension was high between the United States and Japan at that time no one expected the Japanese to attack Hong Kong, and life was peaceful for the first little while; however that all changed on December 8th when the Japanese did attack. The Canadian, British, and Indian soldiers stationed there fought back but because of the small size of the island of Hong Kong they were doomed to failure and on Christmas day, 1941, the allied soldiers were forced to surrender. Of the 1,978 Canadian soldiers stationed there, 290 were killed and 493 wounded. The remainder were placed in prison camps on the island of Hong Kong for the first two years, and later moved to several prisoner of war camps in Japan. Fred Drover was one of 276 moved to Camp 5B Niigata, a labor prisoner of war camp approximately 150 miles north of Tokyo, Japan, on August 15, 1943. Conditions in the prison camps on Hong Kong had been bad, however they were nothing compared to what faced them in Japan. The weather was much more severe and the prisoners had to put up with freezing temperatures with very little clothing to protect them. Food consisted of two or three small bowls of rice a day, and they were forced to work long and hard from morning until night. Packages of food and clothing which were sent to them by the Red Cross were usually confiscated by the Japanese guards. Some of the prisoners took to stealing rations, which led to death for many. In January of 1944, two prisoners who were caught attempting to steal food from a storeroom were tied to posts in the snow with no shoes and very little clothes on. One was beaten to death by a guard and the other left there until he froze to death. During their imprisonment many of the men died of disease, such as malaria, beriberi, dysentery, and diphtheria, caused mainly by their poor diet and fatigue. Others were crushed to death while working on tunnels for the Japanese. The Japanese would become quite infuriated at times because so many of their enslaved workers were dying and would line the remaining prisoners up on the camp square and threaten them. By the middle of 1945, 106 of the original 650 prisoners in the camp had died. It was later learned, during War Crimes Trials in Tokyo in 1946, that Camp 5B Niigata had the worst death record of any prisoner of war camp in Japan. Because Fred Drover had been trained as a stretcher bearer with the Royal Rifles he was selected as a medical orderly and helped care for the sick prisoners alongside a British doctor. There was little they could do for the wounded or sick prisoners however, except to comfort them, as their medical supplies were limited and suitable mainly for first aid. Fred was well respected for his work in the hospital and was later mentioned in dispatches for bravery or courageous actions as a War Medical Orderly. The main source of news from the outside world was a radio which one of the prisoners has smuggled in and which they all managed to keep hidden from the Japanese guards; had the radio been found, that prisoner would have undoubtedly lost his life. May 1945: “Germany surrenders-Hitler dies. Allies take over island off southern Japan (any day now)”. July 1945: “Still sweating it out, Japan still being very heavily bombed. Can’t understand how this country can keep going”. August 1945: “Very sure it is coming close to end”. After nearly 45 months of captivity, the prisoners were freed that same day. They were taken by train to Tokyo for medical examinations. From Tokyo they were taken by an American ship to Guam, and then to San Francisco, where they boarded a train for Vancouver, and then Quebec. They were formally discharged on the 1st of April, 1946. Fred was held in high esteem by his fellow prisoners. Fred Drover settled in Clarenville, Newfoundland, and was the last surviving Newfoundland Prisoner of War from the Battle of Hong Kong. Fred Drover died in February 1990.